By necessity I became a pioneer in what is now called “reputation management” during the last half of my now long concluded nearly four decade career in community destination marketing. This involved standing up for the communities I represented during that span. In the words of an IBM exec in Durham who came to my defense, I was just insisting on what was “justly due” that community. With the backing of a grassroots group of residents we called Image Watchers, we turned the community’s reputation around over a span of about nine years. A turn-around is marked by when a negative positive-to-negative ratio climbs into positive territory. As you might expect, reaching this milestone was not without a cost to my personal reputation, which to the consternation of friends and supporters, I never defended with the same passion. There may have been more if you consider the spectrum of sycophants but there were only a handful of detractors that were publicly vitriolic judging by their thinly disguised verbatim comments on community-wide surveys of my performance. One even passive-aggressively returned a business reply envelope with a hand-written epitaph and taped to a brick hoping to run up the cost to my organization. You can see the handiwork of one of these detractors who was then a public official if you Google my name. Though not the one quoted in the story, this official planted the story along with misrepresentations he knew to be false. Even though it was explained that my severance upon retirement was not a severance but a payout of income that had been earned month by month over two decades but deferred, I suspect the temptation to juice up the story headline and lead in without revealing the source was too much. During the last decade of my career, I added satisfaction with my leadership to periodic surveys of several hundred civic and business leaders to help my governing board discern if the complaints these individuals were making to them were generalizable. They weren’t, but one or two board members always worried about the effect those efforts to undermine me might have, so I was annually tasked with meeting with each of them to learn more about their concerns. But I had already met with each of these complainants numerous times, including one time four-on-one and would continue to do so until I retired, but to little avail. It didn’t help that I could provide data-driven responses. It seemed they could never really articulate what bothered them, especially those who didn’t have an issue but sought to curry favor with someone who did, essentially the definition of a sycophant. But I sensed it had to do with a misunderstanding of roles complicated by misperceptions of power and influence, seasoned with a little envy. Only two or three of these individuals were ever constant. When a couple would drop out, replacements who were unfamiliar with the facts or previous discussions were recruited, perpetuating yet another round of meetings in pursuit of yielding understanding. No one likes to have enemies, but meeting with people who disagreed with me and/or the organizational strategic direction we were executing was something I had made a practice during my entire career. The habit took root when I ventured to meet with a powerful official who had set out to get me fired from my first community destination marketing organization in Spokane. It was second nature when a clique attempted to do the same in Anchorage. My goal in meeting with people who were openly contrary or covertly hostile to either me or our mission was always to gather understanding, but often the questions I was able to answer also begrudgingly garnered respect. It helps to keep in mind when going into meetings such as these that there is a difference between someone being uninformed and ignorant. You have hope for the former but be prepared to face the latter or at the very least understand that changes of heart and mind take time, often occurring after you are gone. In the words of Seth Godin, "Ignorant’ used to be a fairly vague epithet, one that we often misused to describe someone who disagreed with us. Through much of my career, I made it a practice to meet with at least one person every week who disagreed with me while learning to listen carefully and only intervene when asked a question. That, for me at least, was really hard work as was learning not to tell myself a story based on microaggressions. Unfortunately, those habits I learned through necessity and experience are now increasingly rare. But just meeting with someone with whom you disagree does not guarantee dialogue even if they are brave enough to be vulnerable and explain why and how they disagree with you. It is an easy trap to fall into when the answers you get are, “just because,” or “I just don’t agree.” Over time, I learned that in these encounters I had to dial back my passion and determination. It is unfortunate that this book might not now be permitted at BYU. Freire felt that education could not be neutral. It either functions to bring about conformity or functions to develop critical thinking which can lead to transformation. While delving into family history I am often reminded that I am the only son of an only son who was a fourth generation Idaho horse and cattle rancher. This meant that I also carried the weight of what I came to call being the “Fortunate Son,” by my 21st year after the late ‘69 Creedance Clearwater Revival hit. It’s an “anti-war” anthem, a cause I wouldn’t embrace for another two years yet. For me though, the feeling of being a fortunate son began almost as soon as my parents brought me home to the ranch in 1948. I grew up with the sense that I was treated differently. By that, I mean that my patriarchal grandparents treated me differently, as did my aunts on both sides. It was different than how it seemed they treated cousins who were both older and younger, male and female and different too than my two sisters when they came along. Maybe it was just a response to the patriarchal ranching culture along the Rockies but to me the feeling came to symbolize getting things I didn’t deserve. It is a feeling that revisits whenever I receive recognition as I did a few days ago with an award named for Charles Kuralt. He was from North Carolina where I’ve lived for going on 27 years but his heart was along the Big Hole River in Montana, just across the Centennial Mountains from the ancestral Idaho ranch where I spent my early years. Through his One the Road series, Kuralt happens to also be one of my influences to follow a four-decade career in community destination marketing. The sense that I was a fortunate son also meant that to me people expected things I couldn’t deliver, such as being a three sport standout in school like my father. To their credit, my parents -- especially my mother – worked hard to instill humility in me but that came soon enough with the embarrassment, if not shame, of failure. I failed to have my father’s bone structure or speed for that matter. I was also left-handed which presents some learning challenges beginning with tying my shoelaces or lasso a moving steer from horseback. These and many other tasks were complicated by an essential tremor in both hands which, in and of itself, was embarrassing enough. Still, it took a while before I fully grasped that “fortunate son” was a myth. Failure was an option with my parents but giving up and especially not trying were not. In retrospect, I look back at my life through a lens of grit, determination, perseverance and success because it felt that way and people have reinforced those qualities and outcomes. But closer examination reveals an incredible number of failures, including failed relationships, but they were not for want of trying. But for fortune and luck, there would have been more I am sure. But as an exercise in memory and to reinforce humility and empathy for my less fortunate, from the safety of distance I look back at the failures now. Failure and shame seem closely associated for me. Each one played a role in propelling me forward just as for many others they seem a permanent disability. Having been invited by third graders to play tackle football during recess, I picked a fumble up as a first grader and ran the wrong way. I was called out as a fourth grader by my teacher for using my finger on each word as I read. I was cut from my little league baseball team as a fifth grader. I got a C in P.E. as an eighth grader and quit the football team only to come back as a ninth grader. I screwed up as a senior and let my grades slide and flunked my renewal drivers license exam test for using my left foot on the brake. I’ve lost any reliable count of how many times I disappointed my parents. I failed my military draft physical due to a football injury, and then failed five different times over the next four years as I relentlessly attempted end-runs to enlist in other branches of service. I got fired from three different jobs before I turned 40. Oh, and then there were those failed marriages. As I retired in 2009, I read a great book by essayist and poet David White entitled, The Three Marriages. The book’s subtitle is “Reimaging Work, Self and Relationship.” It is not a book about balancing the three but for me especially it explained why I was so successful at the first and until late in life a failure at the third. My take away was that only when I understood the marriage to self was I able to transfer my success at work over a four-decade career to an enduring relationship, which now seems so effortless. I needed a lifetime of relationship-“exile and loneliness” as a part of consummating my marriage to self. I simply had two of Whyte’s marriages in the wrong order. Those failures of relationship were at most, a failure to know and understand myself enough. Work was another matter for me but again fortune played a role. I set out to be a lawyer and backed into the perfect career: community destination marketing. I was always highly “engaged” in my work, as is 30% of the workforce according to Gallup, give or take a point or two depending on the year. This is the good fortune currently shared by 28% of the American workforce according to a study by Imperative, a company founded by Aaron Hurst, author of The Purpose Economy. It is probably part of what made me so much more successful than many peers. Purpose-oriented employees who pursue work as fulfillment and as a means to help other people are found distributed across the workforce and in every occupation. I feel it is a mistake for those who aren’t to see themselves as a victim and look to management to fill them with purpose and engagement. 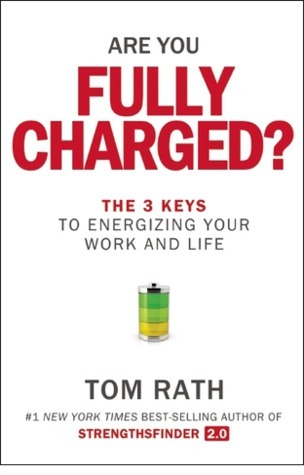 Tom Rath, a best-selling author and senior scientist for Gallup has written a new “must-read” entitled Are You Fully Charged? He concludes that if you seek engagement or purpose directly you may not find it. But if you seek meaning you will find happiness and engagement. Find meaning and purpose in whatever job you do and you will find engagement, something I realize was one of the early values embedded by my parents. For me the stars just aligned more closely than for many not because of the “fortunate son” myth but thanks to parents who put the emphasis on trying.